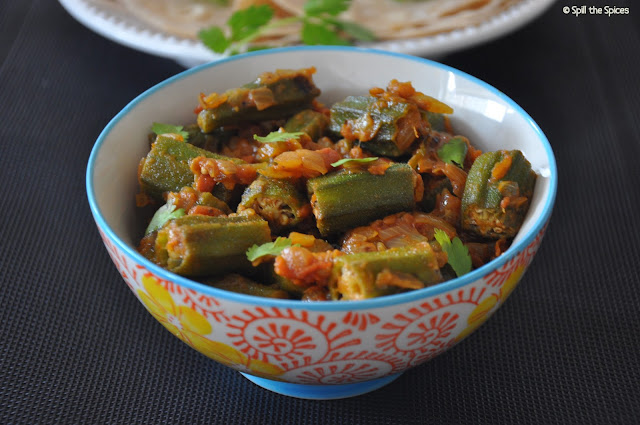 Bhindi/Okra is one of my favorite vegetable. Be it a simple stir-fry, South Indian curry or sabzi, this vegetable adds a magic to the dish. I wanted to make bhindi sambhariya with the bhindi, but then at the end decided to make this simple yet delicious Punjabi Bhindi Masala to accompany roti for dinner. 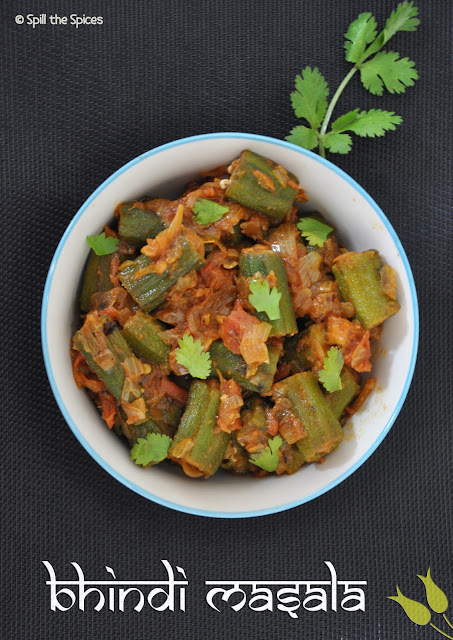 This bhindi masala is full of flavors from the spices. The addition of dry mango powder adds a tang to the masala and kasuri methi gives an extra zing. This bhindi masala goes well with chapathi/roti and even with dal-chawal. Also this doesn't take much time to prepare, so you can make quickly for lunch box or dinner. 1. Wash, dry the bhindi and cut them into 1 inch pieces. Add 2 tsp oil in a pan and saute the bhindi gently in medium flame for 8-10 minutes. Set aside. 2. Heat 1 tbsp oil and add jeera. Add the onions and fry. When onion becomes soft, add green chilly, ginger-garlic paste and fry till onions turn golden. 3. Then add turmeric powder, coriander powder. red chilly powder, garam masala, amchur powder, kasuri methi and remaining 2 tsp oil. Mix and saute for 2 minutes. 4. Then add tomatoes, salt and mix well. Cook till the tomatoes become soft and oil leaves the sides. 5. Now add the fried bhindi and gently combine with the masala. Let the bhindi cook in the masala for 6-8 minutes. Garnish with coriander leaves. 1. Do not add salt while frying bhindi. Do not cover and cook bhindi. 2. Do not stir a lot after adding bhindi to the masala. Gently combine with the masala. Looks delicious..Lovely blog, happy to follow u..
Spicy and yummy punjabi bhindi masala. Super flavored and spicy ! i love bhindi, this is so good. Bhindi gets kasuri methi, amchur etc no wonder it looks so good! 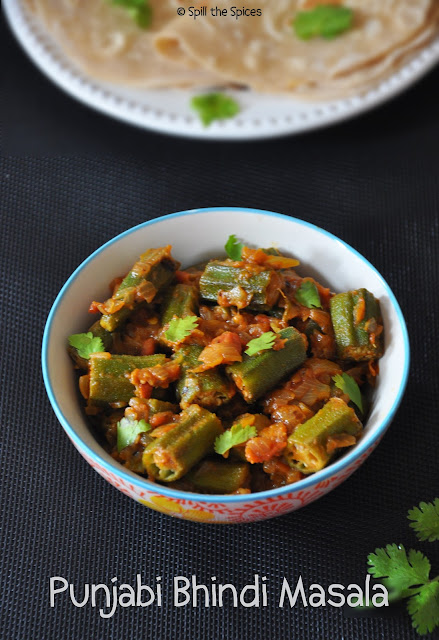 who can resist to this yummy bowl full of okra...i never used kasoori methi in mine...looks so tempting..
Bhindi masala look delicious..healthy and yummy. Delicious, perfect with some rotis.. Excellent recipe, Sona! I'm so lucky that you're following mom's traditon of cooking very tasty and wholesome food!